SYNOPSIS:Take a trip down the highway with city runaway Dorothy (Joy Dunstan) as she heads for the city to catch the farewell gig by superstar The Wizard (Graham Matters). Joining her along the way are a surfie who can't find the beach (Bruce Spence), a bikie who can't stand violence (Gary Waddell), a mechanic who sabotages other people's engines (Michael Carmon) and a 120Kg truckie (Ned Kelly) whose monstrous rig keeps menacing them all. 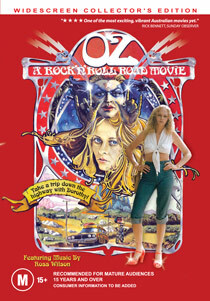 Featuring a great Australian rock soundtrack Ross Wilson and JoJo Zepp and includes the hit "Living In The Land Of Oz"
"One of the most inventive and enjoyable Australian films - clever, brash, noisy gutsy and uninhibited."